Starbucks plans a summit on family homelessness next week, but it remains to be seen what more the business community plans to do to address the region's ongoing crisis. After defeating the head tax, many Seattle businesses say they remain committed to addressing the region’s homelessness crisis, though the details of what more they’re willing to do are still materializing. Starbucks, for one, is hosting a summit focused on family homelessness next Tuesday at its Seattle headquarters, inviting government officials, business leaders and family service providers, facilitated by the consultant hired by the city of Seattle in 2016. Other businesses and business groups issued vague statements in the run-up to Tuesday’s vote about the urgency of the matter, regional solutions, state and federal funding sources and a willingness to do more. The corporate response to the homelessness emergency can seem contradictory. On the one hand, businesses agree that the crisis is worsening and say something must be done. Many in the retail and services industries in particular encounter the crisis daily in their stores. 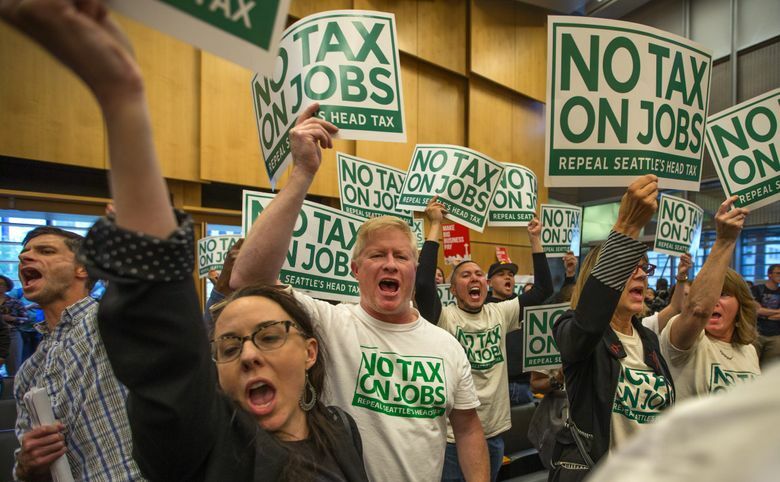 But on the other hand, local businesses marshaled nearly $200,000 to fund the signature-gathering campaign that led to the Seattle City Council’s vote Tuesday to undo the tax, which would have generated an estimated $47 million a year. Seattle was expected to spend $71 million this year on its response to the crisis. That leaves homeless advocates and services providers wondering just how serious businesses are about addressing the crisis. Seattle Metropolitan Chamber of Commerce President Marilyn Strickland said businesses are discussing ways to bring more technology to the homelessness response to more efficiently identify available shelter beds, for example. Companies are also exploring ways to hire more unsheltered people, or those whose lack of employment puts them at risk of becoming homeless. She also suggested the potential for more funding from county and state government sources, and didn’t categorically rule out increased taxes on businesses. “I don’t think the business community objects to the idea of doing more,” she said. But businesses, and many citizens who signed the repeal petition, want to see a more specific plan for how additional funding would be spent, she said, echoing a refrain repeated throughout the debate. “There is a lack of trust that the revenue will be used effectively,” Strickland said. Starbucks, which prides itself on good corporate citizenship, exemplifies the corporate dichotomy. It contributed $25,000 to the No Tax on Jobs campaign, but has also channeled millions of dollars in the last two years to the No Child Sleeps Outside campaign focused on ending family homelessness, a slice of the broader unhoused population. The company’s employees regularly encounter people experiencing homelessness, and it recently changed corporate policies, allowing anyone to use its bathrooms and stay in its stores without making a purchase. The company’s Summit on Family Homelessness at its Sodo headquarters is to be facilitated by Barbara Poppe, who worked on homelessness in the Obama administration and was hired in 2016 by the city of Seattle to report and advise on its response to the crisis. Poppe’s recommendations have formed the basis for many of the city’s homeless strategies. The Starbucks summit is one of a relative few venues for regional collaboration and dialogue about the way forward more than two-and-a-half years into the region’s homelessness emergency. Another is One Table, an effort begun early this year by King County Executive Dow Constantine, Seattle Mayor Jenny Durkan, and Auburn Mayor Nancy Backus, to unify the region’s homelessness response. Businesses are represented among the 75-member One Table committee, and more expressed interest in being involved as the head tax repeal materialized this week. But One Table has so far been stunted. It did not have a quorum at its April meeting and has yet to schedule its next meeting. Businesses and their employees have been giving more to homelessness programs funded through the United Way of King County in the last couple years, said chief executive Jon Fine. The charity expects to raise about $41 million this year and has invested $7.6 million in programs aimed at rapidly re-housing people who have become homeless and helping them get jobs. Fine said each of United Way’s two main programs focused on homelessness are on track to help more than 1,000 people this year. The goal is to double the number of people served next year. Business support “has been instrumental,” he said. Fine anticipates increased support in the wake of the head tax repeal, the debate over which has highlighted how much people care about the issue, as well as their frustration with the lack of progress.